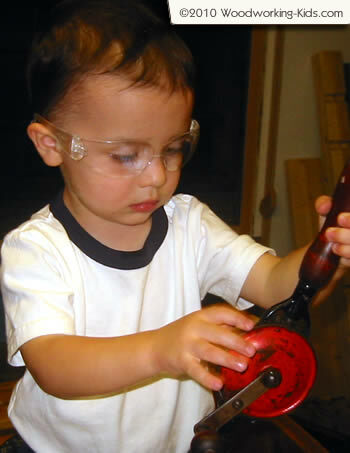 I often had trouble getting my 2yr old to keep his safety goggles on. I had some small ones that came from a Home Depot activity. They made him uncomfortable and he would take them off as soon as I put them on. I couldn’t blame him. They fogged up, were uncomfortable AND they didn’t look like my safety glasses. Then on a suggestion from another woodworker I tried these Radians Mirage Small Safety Glasses. The change was dramatic. They fit his face, they were clearer, more comfortable and best of all he keeps them on. It doesn’t hurt that they look like mine. He often wants to be just like Daddy…for now. Since they cost less than $2 a piece, I bought a dozen of them. So far he’s been using the same pair for several months now. They only have a few scratches on them, and we use them almost daily. When they get worse I will throw them out and give him another. They hold up well. The only time he ever tries to take them off is if he works up a sweat and they get steamed up. He is definitely more safe with these on. They are even ANSI certified. It is important that your child is comfortable wearing them so in case you child is uncomfortable with these. There are a few other styles you could try. Or perhaps choose them because they more closely resemble the safety glasses you use.